Identification: Page and Burr (1991). Native Range: Upper Susquehanna drainage, New York and Pennsylvania; Great Lakes (except Lake Superior) and Mississippi River basins from New York and southern Ontario to Minnesota and south to West Virginia, northern Kentucky, Indiana, Wisconsin, and Iowa (Page and Burr 1991). Nonindigenous Occurrences: Hendricks et al. 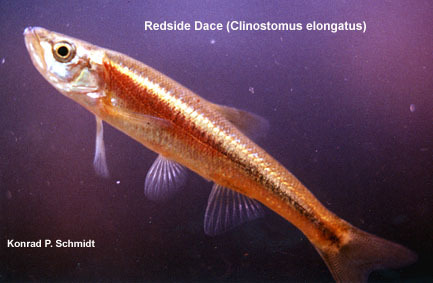 (1979) reported the collection of a single specimen of the Redside Dace Clinostomus elongatus in Bear Creek, a tributary of the Youghiogheny River (Monongahela River drainage) in Maryland. Although these authors noted that the species is native to the drainage, they stated that the Maryland specimen may represent a bait bucket introduction. One of several reasons given was that the site, Bear Creek, is a popular fishing stream stocked with trout. Lee et al. (1980 et seq.) apparently considered the Maryland site to represent part of the native range of C. elongatus. Table 1. States with nonindigenous occurrences, the earliest and latest observations in each state, and the tally and names of HUCs with observations†. Names and dates are hyperlinked to their relevant specimen records. The list of references for all nonindigenous occurrences of Clinostomus elongatus are found here. Means of Introduction: Probable bait release. Remarks: The collection, made in 1977, is the first record of this species for the state of Maryland (Hendricks et al. 1979).